(NaturalNews) June is National Fresh Fruit and Vegetable Month. 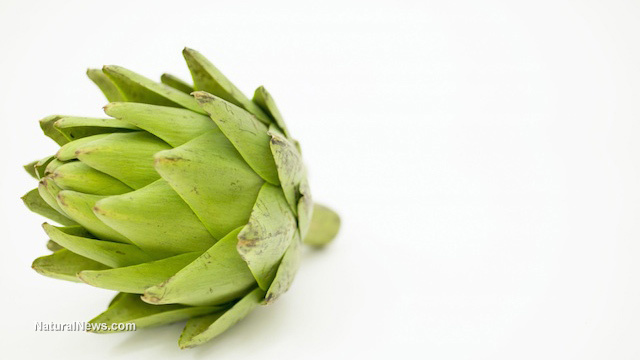 Many foods deservedly stand in the healthy spotlight for their ability to help heal and keep the body functioning at optimal levels, and the artichoke is no different. Artichoke hearts, which are part of the Cynara genus, provide a host of heath benefits (1). Incorporating them into diets often is an ideal way to help the body stay in shape so people can remain as healthy as possible. So powerful is the vitamin C content in artichokes that the Oxygen Radical Absorbance Capacity (ORAC) system has given this food a score nine times higher than other antioxidant-rich foods (1). ORAC rates foods based on their antioxidant capacity; foods high in antioxidants are known to fight off free radicals that damage cells and wreak havoc on the body. Studies have shown that artichoke leaf extract provides relief to those suffering from acid reflux or indigestion pain, leading members of some European scientific advisory boards to authorize use of artichoke to help people with everything from mild diarrhea and nausea to bloating and stomach discomfort (1). Artichoke has been found to contain compounds that play a role in the reduction of cholesterol in the blood, making it a good choice for those with related concerns (2). Specifically, the compounds are sesquiterpene-lactones and cynarin. Because artichokes are a source of vitamin K, which is linked to facilitating brain health by reducing damage to neurons in that organ, it may help patients with Alzheimer's disease (2). Furthermore, artichokes are known to act as a vasodilator, which simply means that the food has properties that expand blood vessels, letting more oxygen reach the brain (3). When there is more oxygen in the brain, improved cognitive abilities can result. Enjoy the benefits of artichokes not only during National Fresh Fruit and Vegetable Month, but every day. Always be sure to choose fresh, organic options.